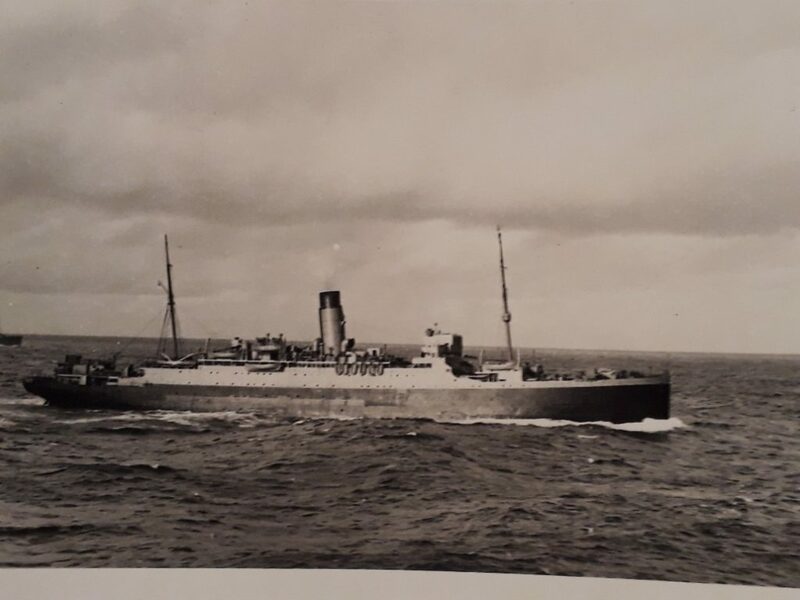 The photographs within this collection have been very kindly supplied by Charles Britton, son of Charles Alwyn Britton, who was HMS Ausonia’s Gunnery Officer when the ship was an Armed Merchant Cruiser. Charles Alwyn Britton had been in the merchant service for eight years in the1920’s and early 1930’s, coming ashore during the depression, just after he got his first mate’s ticket. He served in HMS Ausonia from 1939 until July 1942 when he was sent on the long gunnery course at Whale Island and was then posted to the Admiralty in Bath for the rest of the war. All photographs are copyrighted by Charles Britton unless otherwise stated. 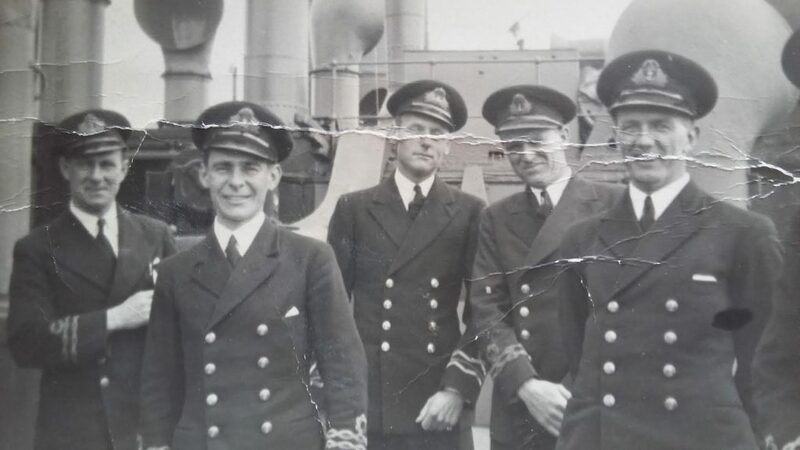 A group photograph of HMS Ausonia’s officers taken in June 1941, while in the North Atlantic. All were RNR officers, except for the Medical Officer. Charles Britton, the Gunnery Officer is second from the left, the other officers (left to right), are: Simpson, the Assistant Navigator, Officer, Coakes, the Medical Officer, Stonehouse, the 1st Lieutenant and S-Smith, the C.B. Officer (Confidential Book Officer). 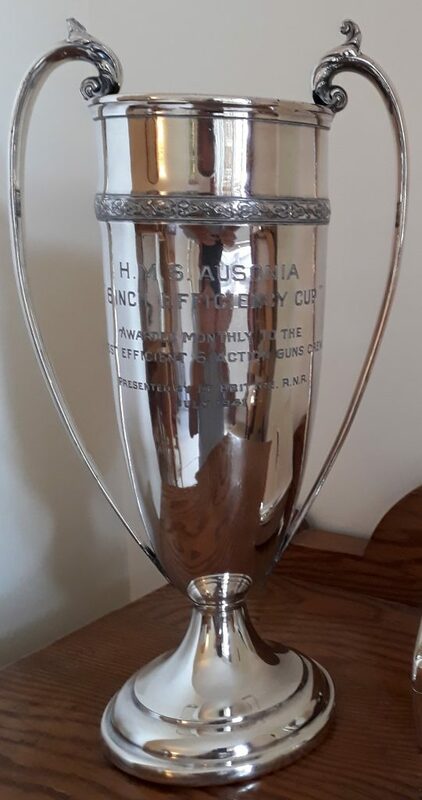 The very same cup is seen in the photograph below, being held by Mr E. Willis, (who served HMS Ausonia from the 2nd January 1940 to the 6th May 1942 in one of her 6 inch gun crews), presumably after being presented to that months winning gun crew, by Lieutenant Britton. Mr E. Willis remembered that they fired lots of practise rounds from the 6 inch guns, but was sure that they only ever fired the guns once at the enemy and this was while the Ausonia was having a refit in Belfast. One night the city and especially the dockyard were heavily bombed by German aircraft and the Ausonia’s 6 inch guns were used in the defence of the dockyard. 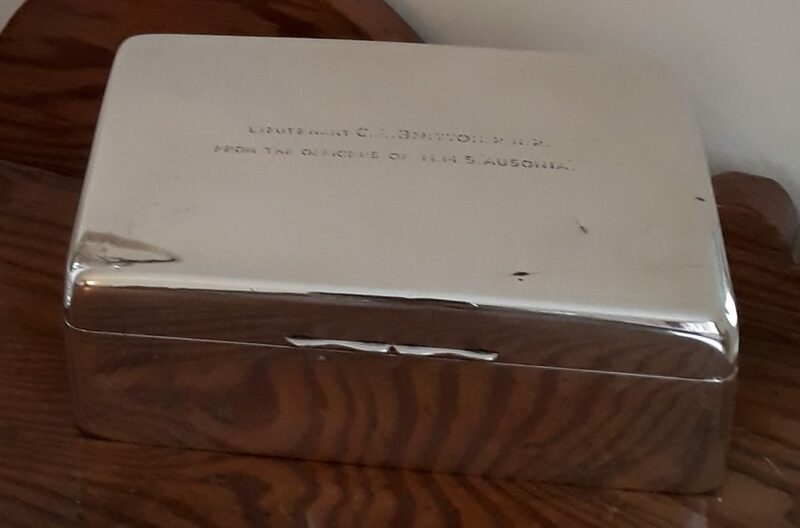 When Lieutenant Britton left the ship in 1942, his brother officers presented him with a cigarette box inscribed with “Lieutenant C.A Britton R.N.R from the officers of HMS Ausonia. HMS Ausonia photographed here escorting a convoy in the North Atlantic in early 1942 during a Force 10 Gale. 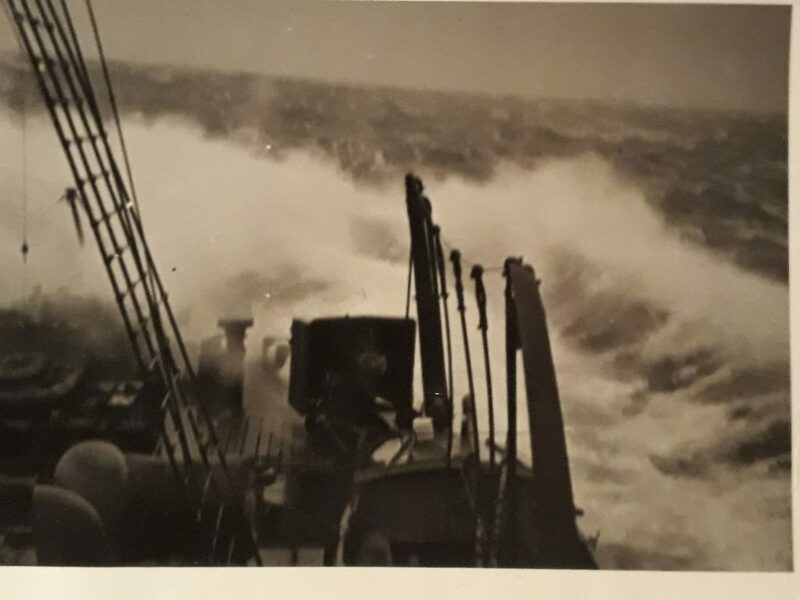 HMS Ausonia’s forecastle S1, 6” gun in heavy weather in the North Atlantic. 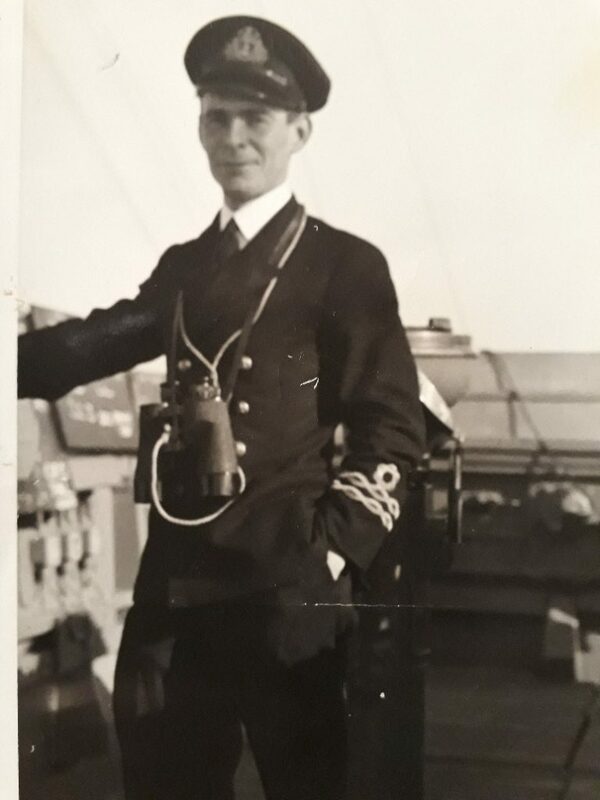 Gunnery Officer, Lieutenant Britton R.N.R, on the bridge of HMS Ausonia. 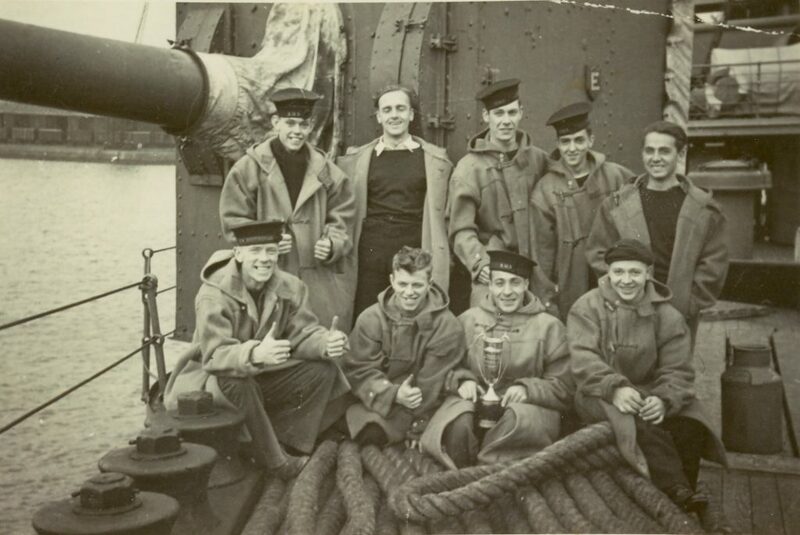 The photograph was taken by his Junior OOW while escorting a convoy in the North Atlantic in 1940. 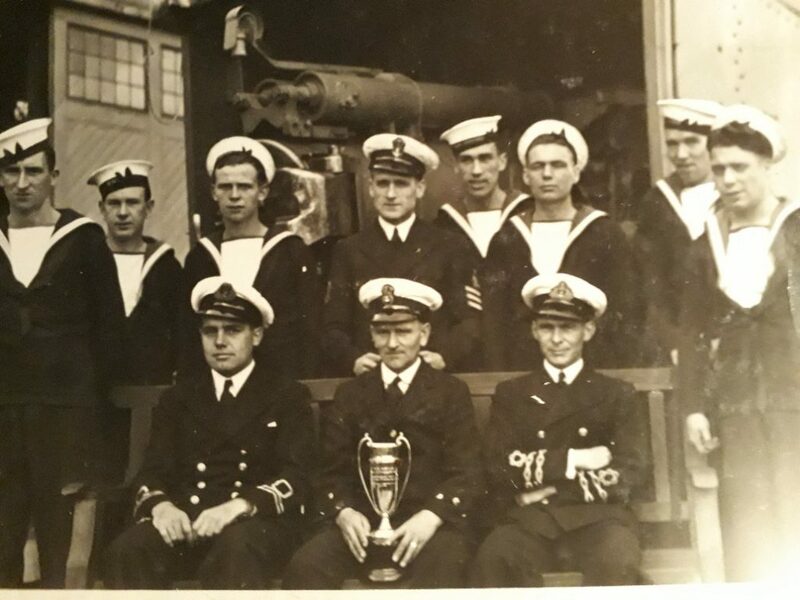 Gunnery Officer, Lieutenant Britton R.N.R, with the silver cup awarded monthly to the most efficient 6” gun crew, the photograph appears to have been taken at a shore based establishment.